This is not just a wedding, is a celebration of life. 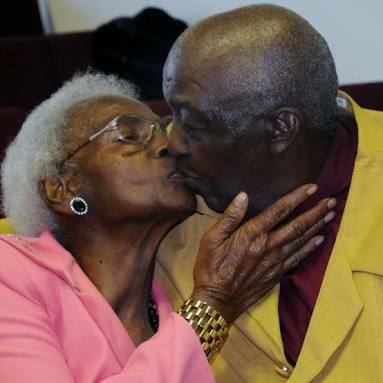 It was a great re-union for a 62-year old woman who recently got married to her 75-year old lover as her children gave her out to the man for marriage. Reports suggests that the woman simply known as Geraldine from Isoko got married to Mr. Joshua from Urhobo in Delta State after their children consented to the marriage. The marriage reception took place at Agbara where the woman lived with one of her children, while she moved to her new husband’s place after the marriage at Omiyale in Ejigbo, Lagos. It was gathered that Geraldine separated from her husband after they had five grown up children while Mr Joshua lost his wife seven years ago. It was learnt that they were lovers in their youth days and Jehovah Witness teachers before they separately married. The marriage between Geraldine and Joshua started after the former love birds met at Agbara, expressed their emotions and resolved to convince their children to consent to their marriage. According to PM Express, Geraldine first called her children and told them that she was lonely and needed a man that will take care of her emotional needs since she has separated from her husband. She also reportedly told them that she had a lover before she married their father and the lover lost his wife some years ago and was also lonely. On the side of the man, it was the same thing because the children saw it as adding extra burden to the family but had no choice than to consent to make the man happy again. When P.M.EXPRESS visited the new couple and asked to know how they were coping with the marriage, they said it was easy for them to settle down because they have known each other over the years.